As of today, I only sleep 4 more times in my own bed before I head to Pasadena for QuiltCon. I will be arriving early on Tuesday morning because I am volunteering to help set up the show; I expect it will be a great learning experience for me to participate (in a very, very small way) and see a bit about what it takes to put a show like QuiltCon together. In all the lead up preparations for being gone for almost a week (serious meal planning is going on people, my husband tends to forget to eat when I am not home! ), I still managed to get a bit of sewing done this week. In fact, I made a very cute 4-inch square mini mini quilt that will be shipping off to Canada today. The back of the mini quilt is the aqua prisms fabric that I used in the Pool Tile mini quilt, and I quilted from the back using the lines of the prisms print as a guide for my quilting. Although in the end, this mini mini quilt is being swapped as part of the Instagram #miniminiquiltswap, I made it as a demo item for this past Tuesday’s Periscope hop. The topic was Finishing Techniques, and I thought I would demonstrate and talk about how I bind these tiny quilts. If you are interested in the video, you can view my Quilt Finishing Techniques through katch.me. My other big accomplishment for the week is that I finished the quilting on my Midnight Mystery Quilt! Yay! You can see a sneak peek of some of the quilting behind the mini mini quilt above. I am not going to lie, though; I was not so sure I was going to get to finish quilting my Midnight Mystery Quilt, or any other quilt for that matter, on my longarm. Wednesday afternoon I was quilting along and my APQS Millennium made a popping sound and then I smelled burned electronics. I shut it off and when my husband came home from work, we spent an hour that night inspecting all the circuit boards. [Side note: I love how easy it is to self service and maintenance my APQS machine; it is one of the main reasons I purchased it.] Anyway, we could find no electrical unit (capacitor, resistor, diode, fuse…) that looked popped or even any soldered connections that looked browned on the boards. After both the longarm and I had an opportunity to sleep it off, I was able to actually finish the quilting on the mystery quilt and I have figured out that the bell that beeps when in stitch regulator mode is what burned out. It is quieter to sew with now, and as long as that is the only problem I am *so* relieved! I love my Millennium and hope it doesn’t scare me like that again! I went for a lot of texture and quilting motifs by playing with #FlowQuilting in the background, and I kept the quilting within the star blocks themselves a lot more sparse. If I am lucky I can get the binding on before I leave for QuiltCon. We’ll see. I have a fat quarter bundle giveaway from the Fat Quarter Shop open through Sunday at 11:59pm EST, so be sure to help me Welcome the Fat Quarter Shop as a Quilting Jetgirl sponsor and sign up for a chance to win! The giveaway is now closed. Congratulations to the winner, Minn R! Linking up with Finish It Friday, TGIFF, and Can I Get a Whoop Whoop. Love your mini mini quilt fabrics and all. That sounds like a lot of fun and work, setting up for the show, it should be a really interesting experience. Enjoy and enjoy QuiltCon! That was quite a scare with your longarm! I’m so glad it’s not something major wrong with it. 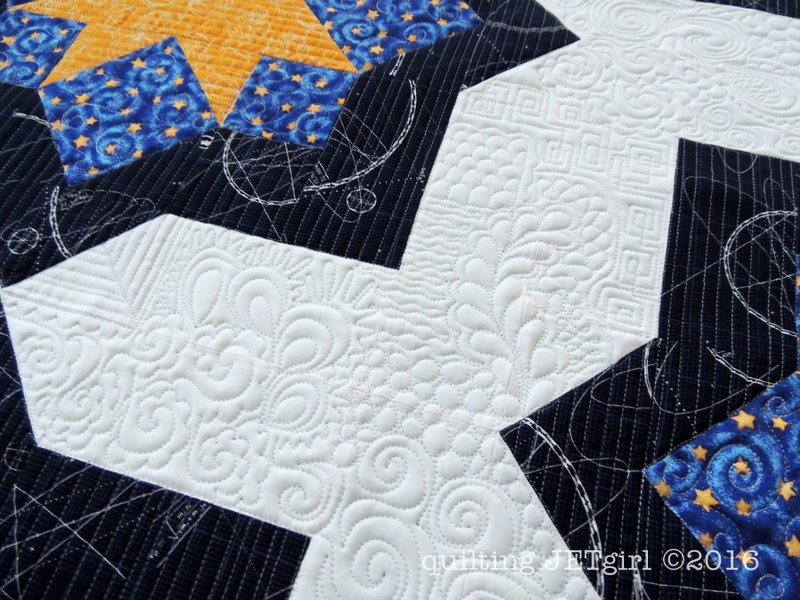 Your quilting on the Midnight Mystery looks amazing and the mini mini is really cute too. Have fun at Quitcon, and post lots of pictures for those of us living vicariously through you! Love your mini mini!! Also love Fat Quarter Shop. If you need something you can’t find locally you can always go to their website and find it!! How scary! That smell always is sickening, because it is the smell of trouble. So glad you could continue. What a great selling point for your APQS! I threw the timing out on my long arm once. I was sick to my stomach! Love your little mini mini! That was scary about your machine! Oh, the quilting on the midnight mystery, beautiful! I hope you have a fantastic time at QuiltCon. Thank you for volunteering to hang the show. That should be a wonderful experience. I hope you couldn’t detect the jealousy in my voice 🙂 I really am excited for you! I can’t wait to hear your report from QuiltCon! It’s going to be so cool for you to see how things work behind the scenes! I really like the look of that flow quilting!! Beautiful quilting. QuiltCon should be a great fun time. Enjoy and collect lots of buttons. Nice job getting the mystery quilted! I put that down as a goal of mine this month but I’m likely not going to make it. I’ve been having the same worry for my husband while I’m at quiltcon; I’m not sure he will eat anything while I’m gone. How are you setting up the food for your husband? I will try to get a lot of frozen food for mine. love your mini and FQS! Good Morning Yvonne! Miss a morning with you and I miss a whole lot! So congratulations on your new sponser! I really enjoy their site. So glad that your machine is still working and helping you create all of your spectacular quilting. Pebble quilting is so fun, but boy oh boy does it take time. LOL. I hope that you have a safe, fun and exciting trip! The mini is fun and I love the quilting on your mystery quilt. The flow quilting in the background is awesome! What a cute mini! I love the quilting that I can see on your Midnight Mystery Quilt. So fun and free-flowing! Sorry about the machine scare… that would give me a big case of the worries too! Glad it wasn’t a big problem and you were able to complete your quilting! I am so jealous! Quilt Con is going to be amazing! I hope to go one day! 🙂 I love your mini! I really love your quilting on the Midnight Mystery Quilt! Gorgeous! Have a safe trip! Nice quilting! I hope you have a fantastic time at Quilt Con; I look forward to enjoying it vicariously. All that flow quilting looks like so much fun! I was thinking about planning some easy meals while I’m gone…but at this point I’m just going to focus on not being sick on Wednesday. I’m sure they’ll manage, and the kids definitely don’t forget to eat. look at that lovelly feather in your Midnight Mystery quilt! I’m glad your machine is o.k. Love the quilting on your mystery quilt! Glad to hear it wasn’t something major wrong with your longarm! 🙂 Hope you have a lot of fun at Quilt Con! It would be so fun to help with the show set-up, I hope you have a wonderful time! Thank goodness it was a tiny hiccup with your machine. I have seen so much growth in your quilting style since you brought your machine home; the flow quilting you did is fantastic and I love the look of it! Have fun at QuiltCon. I’m planning to attend next year on the East Cost. Look forward to seeing and hearing all about the fun I just know everyone will be having. Phew! That’s a relief, and your quilting looks great. So glad you were able to get the machine working again. Your flow quilting is so pretty. Thanks for sharing the sneak peek. Your husband tends to forget to eat when you are not at home? If my husband skipped a meal, I would take him to see a doctor as quick as can be. Something would have to be seriously, seriously wrong! I am glad the burning smell was only a bell. My husband does that too! I wish I was going to QuiltCon, istead I’ll be heading on a quilting retreat with our guild! I do my mini mini quilt bindings very much like you do! It makes for a nearly perfect binding every time! Have fun at QC…it’ll be amazing!! 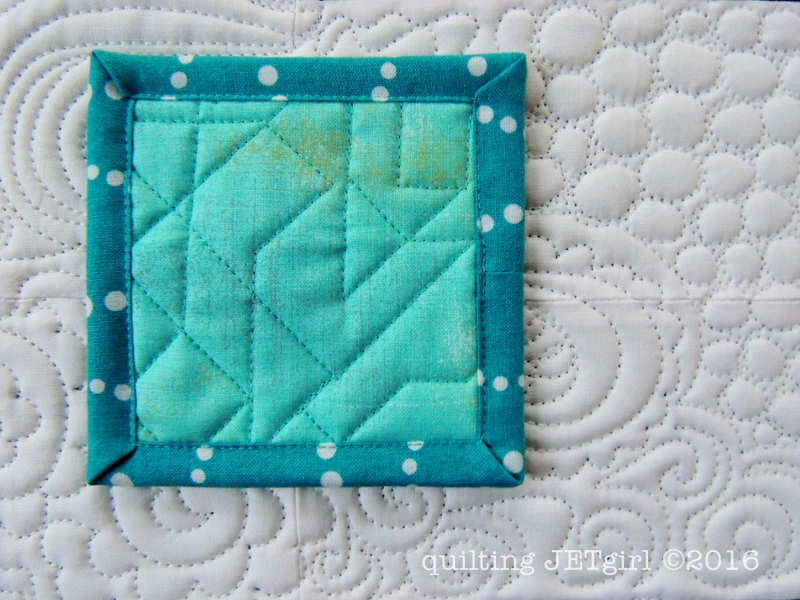 Cute mini, mini and your Mystery quilting looks stunning. So glad your burning was just a bell, must have been a huge relief.